Tartar being removed from a mandibular canine tooth with a scaler. This tartar can build up and promote gingivitis, resulting in painful, irritated gums surrounding the affected teeth. Treating this oral pathology is just as important in horses as it is in people. 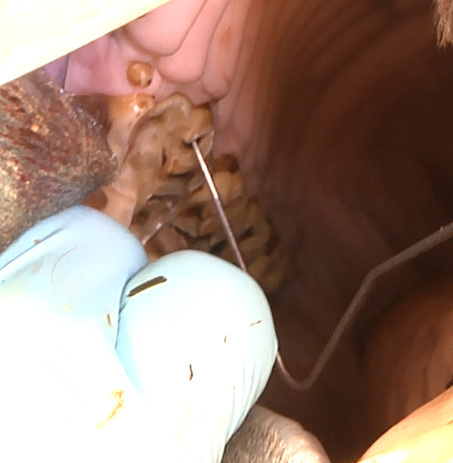 Feed being removed from between two incisor teeth. Grass, hay, and other pieces of feed can become lodged between teeth and rot, causing gingivitis and periodontal disease. I have developed and use a dental flossing tool that works great on treating this oral pathology! Wood chewing in a 7 year old mare. The leading edge of both upper incisors are overworn from cribbing and wood chewing. This can lead to a reduced lifespan of these teeth. Inappropriate eruption in a 2 1/2 year old gelding. The adult right first incisor can be seen erupting forward of the deciduous tooth (the horse's right, your left). The adult tooth is more yellow in color than the white deciduous tooth that can be seen below the edge of the adult tooth. The deciduous tooth required extraction to enable the adult tooth to erupt into its normal position. 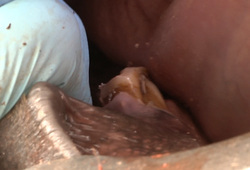 A large amount of rotten feed material was found between the two teeth, and was removed. A wolf tooth and deciduous first cheek tooth in the young gelding from the previous image. The probe is contacting the deciduous first cheek tooth that is close to being expelled, which will allow the adult first cheek tooth to erupt into the mouth. The wolf teeth in both maxillary arcades were extracted. Gingiva being elevated off of the wolf tooth shown in the previous image. Specialized wolf tooth extraction tools are utilized to ensure that these often troublesome teeth are removed completely and with little trauma. 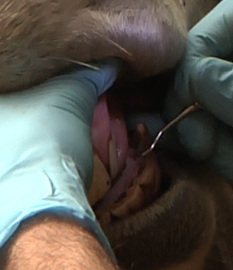 Not all wolf teeth require extraction, and should be discussed on a case-by-case basis. 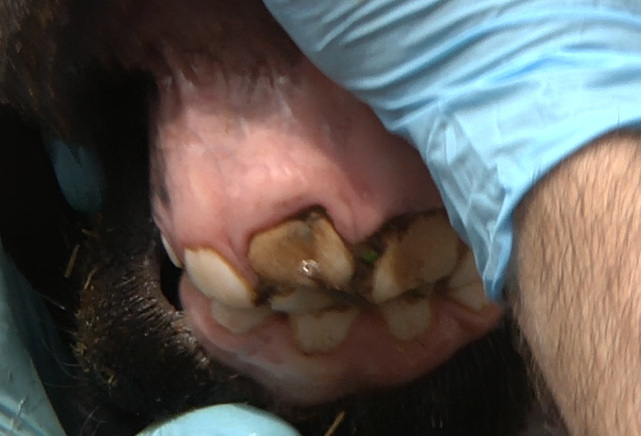 Wolf teeth removed from the gelding in the previous images. Minimal soft tissue trauma allows for quick healing and less discomfort. 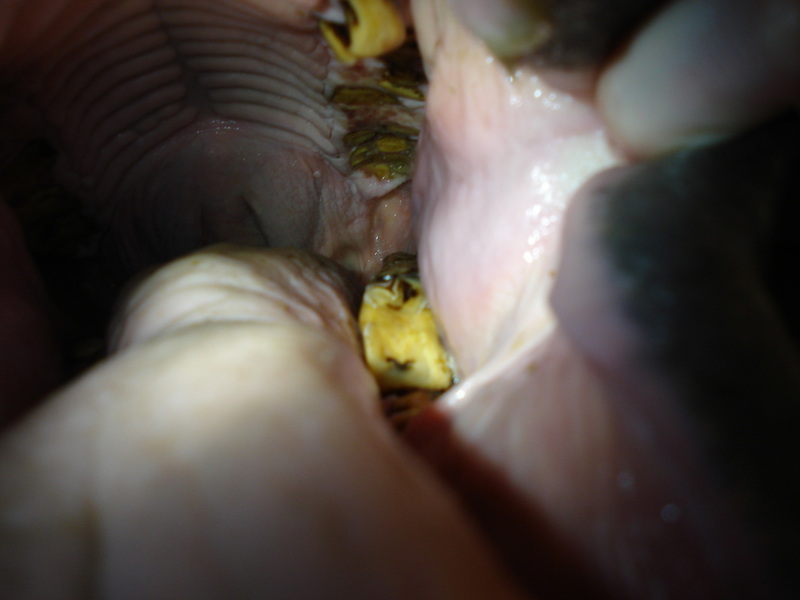 An erupting adult mandibular first cheek tooth in the same gelding. 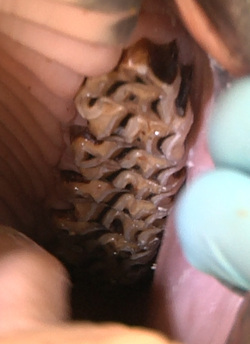 This teething process can be uncomfortable for a young horse, and will continue until the horse is 4-5 years of age and all three deciduous premolars (caps) in each arcade are shed to allow the adult premolars to erupt into the mouth. 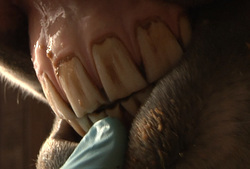 Including incisors, a total of 24 deciduous teeth will be shed by the time the horse is 5 years of age. Overgrown sharp enamel points in a 7 year old mare. These enamel points form on the outside edge of the maxillary cheek teeth and on the inside edge of the mandibular cheek teeth. 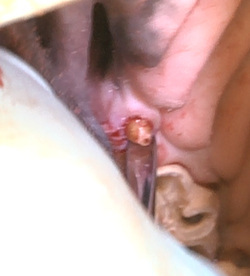 The probe in this picture is demonstrating the sharp enamel point responsible for the cheek ulcer that can be seen towards the bottom of the image (the darkly discolored region near the neck of the probe). In addition to causing cheek and tongue ulceration, these overgrown enamel points can cause difficulty in chewing. Reduction of sharp enamel points is an important part of a management program for your horse, and should be performed yearly. Maxillary cheek teeth of the mare after floating. The floating procedure takes only a few minutes with proper equipment and training. Notice the difference in the enamel points from the previous image. The cheek ulceration demonstrated in the previous image will heal soon, and this horse will have much improved chewing efficiency and comfort. As the teeth continue to erupt over the span of the horse's life, these sharp points will return and require routine floating. A large hook on the upper left arcade of a 9 year old mare. This hook was traumatizing the cheek directly next to it, causing a buccal ulceration. The owner was also reporting bit aversion to the left. This hook, if left unreduced, will continue to elongate, causing chewing difficulties and can even cause this tooth to shift out of normal position. 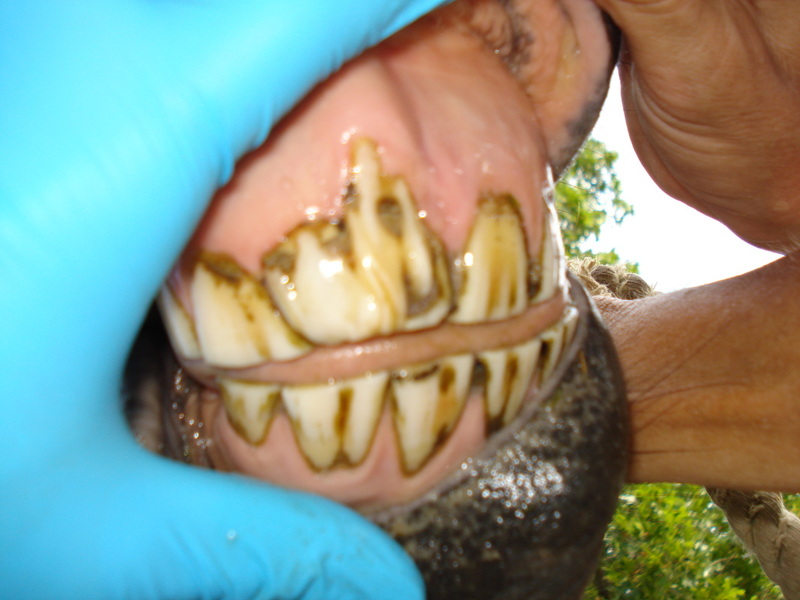 This horse requires dental floating every 6 months to reduce this overgrowth. The left side of a 30 year old horse's mouth. Notice that the maxillary cheek teeth are expired to the gum line and the chewing surface remaining is completely smooth. The mandibular cheek teeth still have some crown remaining and the grinding surface is not yet smooth. 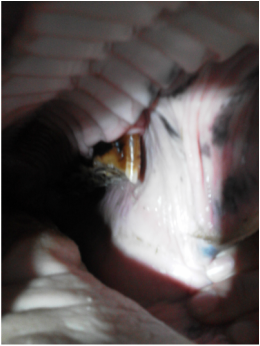 Close inspection of the gingiva between the remaining pieces of maxillary cheek teeth reveal areas of bruising due to mandibular cheek teeth traumatizing the exposed gums. An interesting tooth in a young gelding. This horse's first upper right incisor was abnormally formed, and was twice the size of any other incisor and appeared to have two roots. This tooth causes the other maxillary incisors to not line up correctly with the mandibular incisors, warranting routine incisor floating to prevent overgrown teeth.